The Mauldin Group, one of Atlanta's leading marketing agencies, is dedicated to marketing education and supporting the North Georgia business community. With a commitment to offering business owners, corporate professionals and individual entrepreneurs, information on the latest digital marketing trends that are crucial to success, we actively participate in several chamber of commerce organizations and networking groups. As part of that dedication we host a monthly Wednesday "Marketing Lunch & Learn" networking event, are an active participant participate in local business expos and act as sponsors for community educational and charitable events. We'd love to meet you and invite you to visit this page often to learn of events The Mauldin Group is involved with. Wednesday 11:30AM "Marketing Lunch & Learn"
The Mauldin Group's exciting monthly "lunch & learn" networking events allow you to network with some of Georgia's most recognized business leaders while learning valuable insights into the Digital Marketing world from one of Atlanta's most creative and successful marketing teams. Check out what's coming up and sign up now, space is limited and seats are filling fast! Featuring a catered lunch by Choices To You! Jan. 24, 2018 -- Online Reputation Management: For a business nothing can be more important than your Online Reputation Management (ORM). ORM can bring new customers in the door or drive them away. Find out what good ORM is and how to make the most of it for your business growth. Feb. 28, 2018 -- Search Engine Optimization (SEO): Are internet searches landing on your webpage? SEO done improperly is not SEO at all. The Mauldin Group will take you on an exploration of what SEO is, how it's done and how you can use it to your advantage. March 28, 2018 -- Social Media Marketing: The "World of Mouth" holds more power than ever in the marketplace. Within seconds a post can make a business brand instantly recognizable OR, associate it with terrible service. 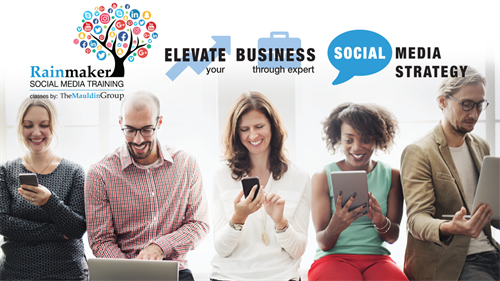 In this impactful workshop you will earn the critical Do's and Don'ts of social media that can showcase your business to thousands in seconds. April 25, 2018 -- Pay Per Click (PPC): Pay Per Click is a tool that can literally pay off in a few clicks. Yet for many companies, PPC is still the unexplored territory shrouded in mystery. The Mauldin Group will share with you what makes up a great PPC campaign, what measures mean and how it can pay off quickly if done well. May 23, 2018 -- Content Marketing: Good website content brings customers to you and drives them to purchase. While critical to SEO performance, many businesses still don't know the value of good content to their messaging. Learn what makes content marketing so important and what your messaging needs to say to keep visitors coming to your website.